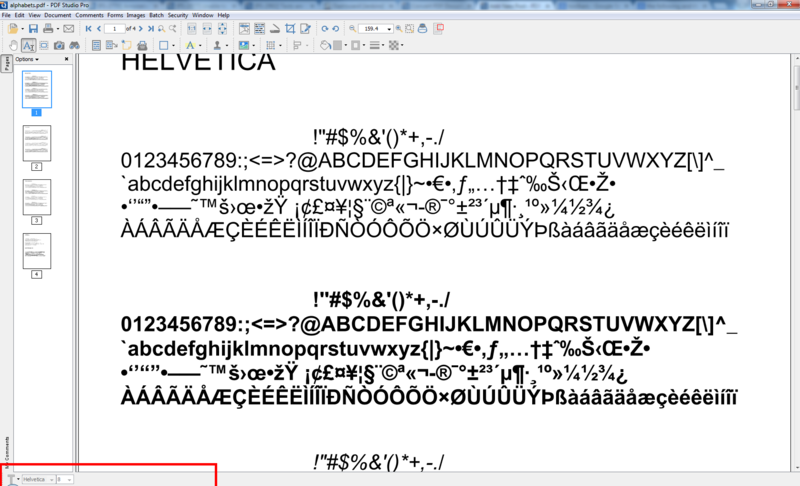 Q: Is it possible to customize PDF Studio toolbars? 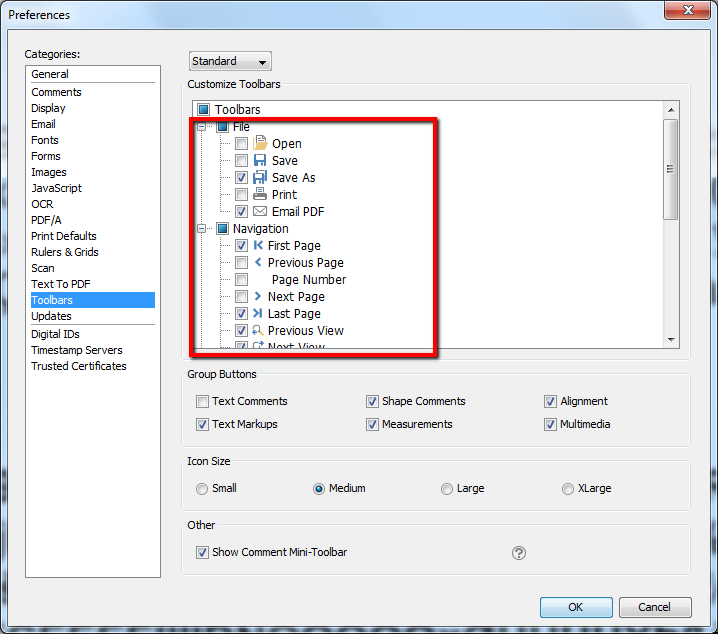 Follow the instructions below to customize the toolbars to your needs in PDF studio. Drag and Drop: To rearrange the tools on the toolbar using drag and drop, click on the divider line to the left of the tool group you wish to move, and then drag and drop it into new position. You can move any of the tool groups to any location on the toolbar. A third row can be created by dragging a tool group below the second row to create a third row. Click on the left divider line of a tool group and start dragging. A red rectangle displays to indicate the new location. Let go to drop at the desired location. 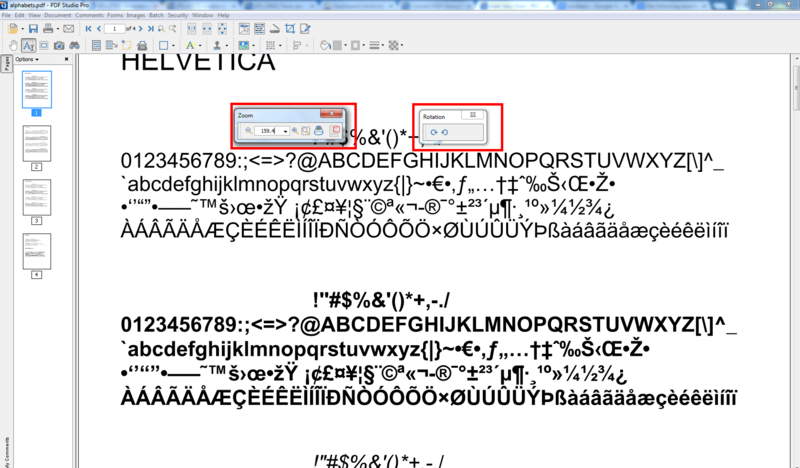 You can also create a bottom toolbar by dragging the tools and dropping them on the bottom of the PDF Studio window (see below image). 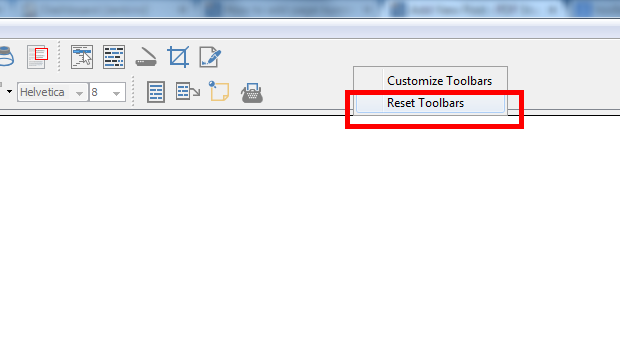 Right click on a blank space on the Toolbar and select “Customize Toolbar” option. 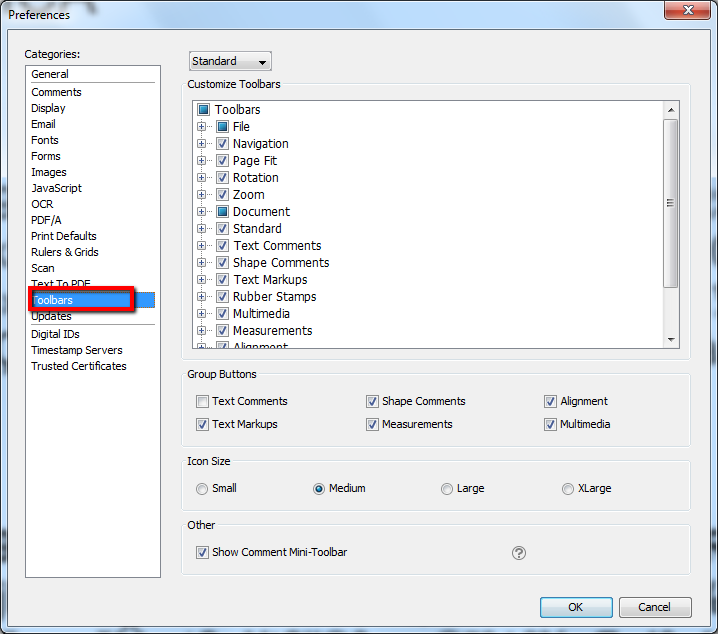 Go to Preferences (Edit -> Preferences or PDF Studio -> Preferences) and select Toolbars tab. On Customize Toolbars dialog, expand all the sub-menu and check/un-check the icons that you would like to have available on the toolbar. Floating Tools: Tools can also be floated in other locations for easier access. 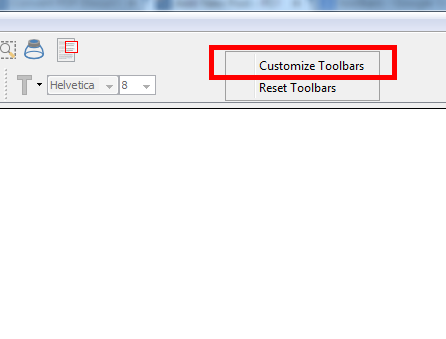 To float any of the tools from the toolbar click on the divider line to the left of the tool group you wish to float and drag your toolbar out of the toolbar section and then drop it into new position not on the top or bottom toolbar to leave it floating. To return it back to the toolbar either drag it back to a location on the toolbar or Click the “X” button and it will return to to its last location on the toolbar.